Refrigerated shipping containers are the perfect solution for any goods requiring storage or transportation under regulated temperature and humidity conditions. Although they are known as refrigerated shipping containers, they have a range of -25C to +25C, giving the client perfect conditions for both refrigeration and for items that need a certain ambient environment. 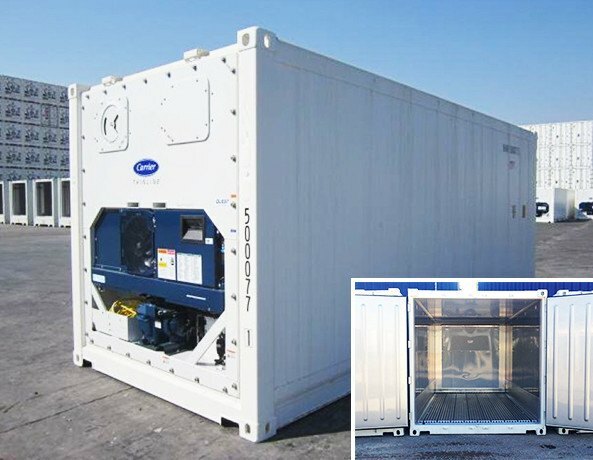 Our refrigerated shipping containers have been specifically chosen by our team of experts for their low power consumption and they are the most environmentally friendly units on the market.Available in 10′, 20′ and 40′ – standard or high cube sizes, these containers have a temperature range of -20°C to 20°C. Generally refrigerated shipping containers require three phase power to operate, however we also sell single phase shipping containers known as chillers. Premier Shipping Containers stocks both new and used refrigerated shipping containers for sale at our Narangba container depot. General Construction: Corrosion resistant Muffler Grade Stainless Steel exterior with a three coat paint system and smooth High Grade Stainless Steel inner linings and aluminum scuff plates. An insulated base with aluminum “T” section floor rail and corrugation subfloor. Testing: All containers are checked on the production line for dimensions, door operation, quality of construction and air tightness. Note: Measurements can vary and therefore the below information should only be used as a guide. Refrigerated shipping containers are high value specialised items, and as such we do not hold inventory in all Australian locations at all times.